This entry was posted on Friday, June 29th, 2012 at 11:47 am and is filed under Higgs Hunting, ICHEP, International Linear Collider, Large Hadron Collider. You can follow any responses to this entry through the RSS 2.0 feed. Both comments and pings are currently closed. 29 Responses to What’s the deal with H → WW ? Thank you Phil. It was a very nice summary about the situation. Thanks for a well-written summary, Phil. Keep up the good work! but a neutral technipion-type (or my type) meson ? If that is the case, where would Higgs be found ? could there be one or more peaks that have low individual cross-sections but, when added together, would have the total cross-section of a SM Higgs ? as two SM Higgs mass states) ? Is there an official combination by the LHC-HCG of CMS + Atlas for 5 /fb of 2011 — like they presented in Nov 2011 for 2.5 /fb? In your plot of this post is it also possible to show the combined data point of all the channels (ie combo of bb, gamma gamma, tau-tau, WW, ZZ) with its error bar? What is the weight of each channel to this combined point? The combined point assuming flat normal distributions is 0.94 +- 0.23. To get this the points are weighted by the inverse square of the size of the error bars. No LHC combination for 5/fb was published. They said they would do one and they may have started, but the results kept changing and they ended up not doing it. Ok thanks that means the WW channel gets roughly 4 times the weight of anyone of the rest 4 that are of similar weight. It is interesting how it balances the remaining four. The four excluding WW would have pbly given 1.6 +- 0.4 or so I guess and WW averaged this out being loser to 0.2 or 0.3? You are right. It is lucky that it all evens out exactly in the combination. Great article, thanks. In your nice plot above, how many standard deviations are the bars? The big question isn’t just the WW channel, but the ratio of the WW to the ZZ. In most extensions of the SM, this is the same as the SM (not surprising since the isospin breaking would violate the rho parameter bounds). Models exist where this isn’t the case, but they are quite ugly. I wasn’t aware of that, very useful to know. It underlines that the discepancy will be hard to explain away with theory. Since the top of the WW error bars matches the bottom of the ZZ bars this condition is not yet very significantly stretched but it should be look at again next week. The situation is more complicated cause also gammagamma enters in the game (if one is not adding extra particles). Based on our previous experience with W-Z experiments from the early 80s, I can’t imagine there are too many unknowns in their decay path but maybe there are. If the statistical and measurement issues get ironed out with more data (six-sigma?) and we still see a low WW channel, does this suggest that the SM mechanism for electroweak symmetry breaking may be incorrect? It looks like you did not read the article. I guess I need to clarify – I understand the mass and perturbative errors, but the unknown I am referring to is why we would see a low WW signal when we know (or assume) this must produce the high diphoton signal that is measured? Unknowns in the pathway is what I am referring to, such as Tony’s neutral meson comment). If there are ZZ or WW decay channels the Higgs particle has to have a mass greater than 160GeV ~ 2M_w or 180GeV ~ 2M_z. The 125GeV Higgs can’t have these decay channels. These di-particle channels would indicates something about a higher mass Higgs in some MSSM model. And an electron can not decay to W plus neutrino neither, as it should have a mass greater than 90 GeV. But OK, there is something true here, and it is that being a decay via a virtual particle, small variations in the mass of the Higgs could cause noticeable change in the ratios. Lawrence—ATLAS and CMS have reported extensively on the ZZ and WW decay channels of a 125 GeV Higgs. No, they are not unaware of energy conservation. At least one of the vector bosons is virtual (which makes it a 3-body decay, thus suppressed relative to bb). but this is a lousy way of stating the decays — i.e. to virtual particles….why cant they use a more correct method where the decays are really decays. For example it is not clear how the interference terms have been handled since virtual Z and virtual W channels can potentially. interfere in the actual decays. As an off shell process I can see this, but it seemed as if this were discussing real Z’s or W’s. In this process the two Zs transition into mesons or a W decays ultimately into a lepton plus its associated neutrino. The decay is to two leptons and two neutrinos with the largest contribution coming from diagrams with WW. Full caclulations are done using the complete Feynman diagrams including next order. You cant just think of it as indepednent sequences of deacy. In other words the H and W are virtual and off-shell so the heavy mass does not stop them being involved. However it does suppress the rate which increases rapidly as the Higgs mass increases. What I still do not like is that most of the bb measurement comes from CDF last batch of papers, which were not very successful for other deviations. It is a good thing they are going to speak too. 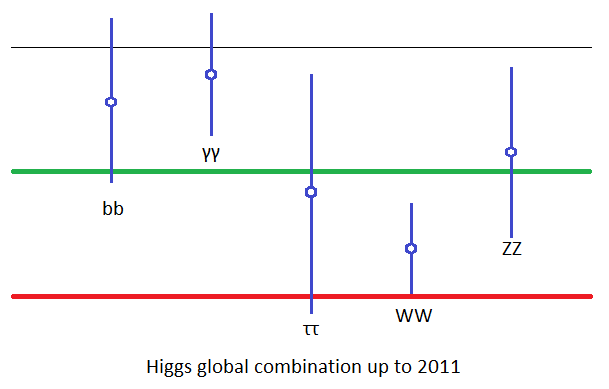 Would everything look roughly OK if the Higgs was a bit lighter than we assume from the current data? If you could shift it 8 GeV lower the branching ratio to WW would be half us much and it would not look so bad. That sounds like a lot but the mass resolution is not good for WW. The analysis should account for stuff like this so it should not be an explanation but it would be worth asking them questions about it. Well, 8 GeV is quite a lot. I was really fishing for the possibility that a 1 GeV difference would change the conclusions completely. I do hope you’re ready to make a similar analysis as soon as the new data comes in 🙂 Apart from the not-so-relevant five sigma or not info, what can be said about deviations from the SM will be very interesting.